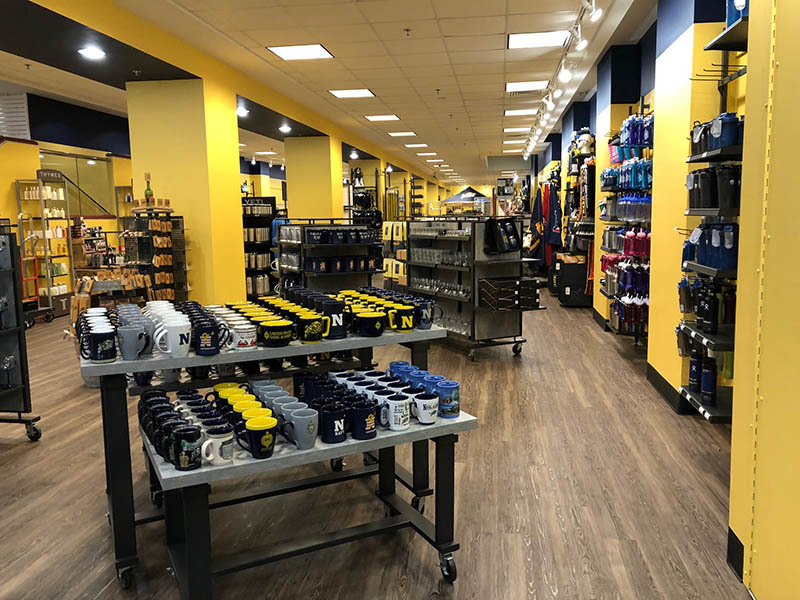 The Midshipmen Store is a non-appropriated fund retail activity to service the needs of the Brigade of Midshipmen. 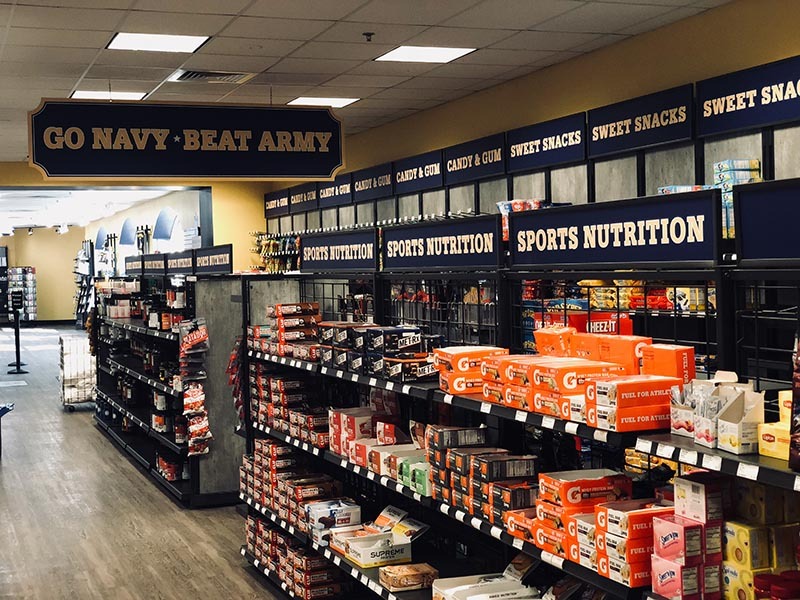 This retail activity carries a wide range of items required by the Midshipmen in the performance of their duties, and also a complete line of U.S. Naval Academy and Navy emblematic clothing items and gifts at unbeatable prices. 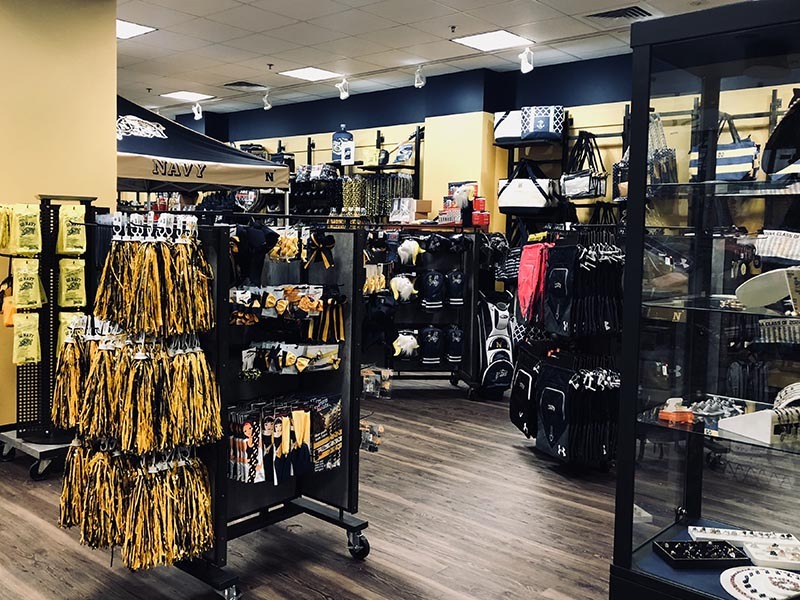 Authorized patrons of the Midshipmen Store include the Brigade of Midshipmen and their parents, alumni and their dependents, as well as U.S. Naval Academy faculty and staff, Blue and Gold Officers, and other groups as authorized by the U.S. Naval Academy. 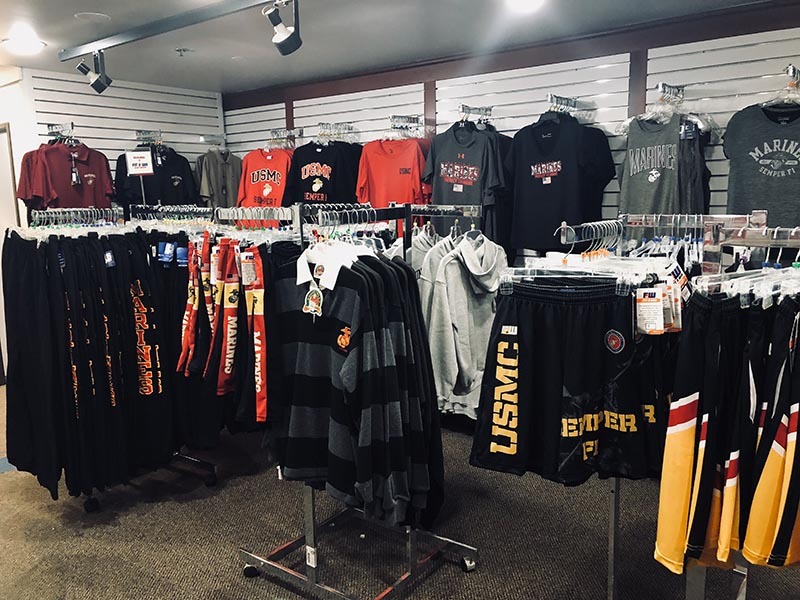 The Store is set up to service and benefit the midshipmen. Profits are used by the Superintendent to support activities of the Brigade of Midshipmen, including over 100 Brigade Extracurricular Activities and Club Sports. These activities are important in the complete development of the Brigade of Midshipmen. 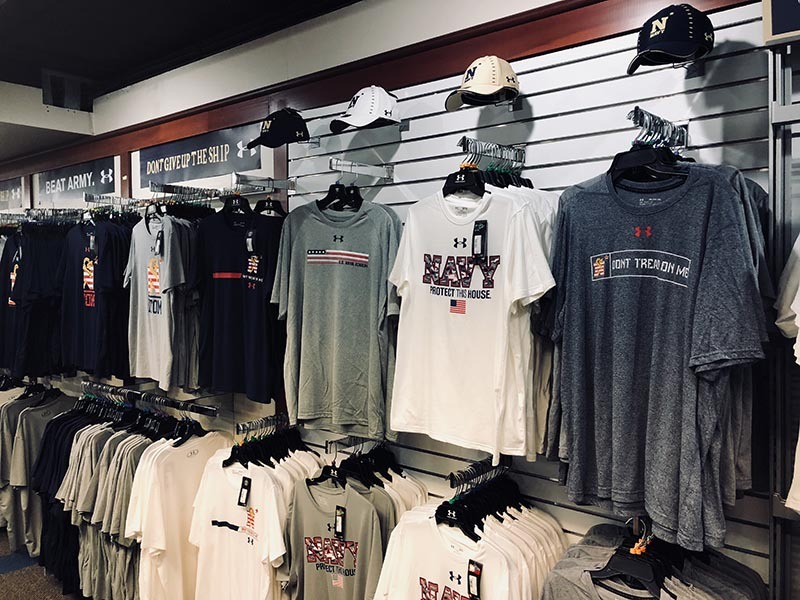 Visit NavyOnLine, the online Midshipmen Store. Midshipmen and members of their immediate family. Verified by their uniform or Military ID if in civilian clothes. Parents are issued a store shopping card. Active Duty, Reserved, or Retired Military Personnel and their dependents. Personnel must present valid Military ID card. Civilian Faculty and Staff stationed at USNA and the Annapolis Area Complex and their dependents. 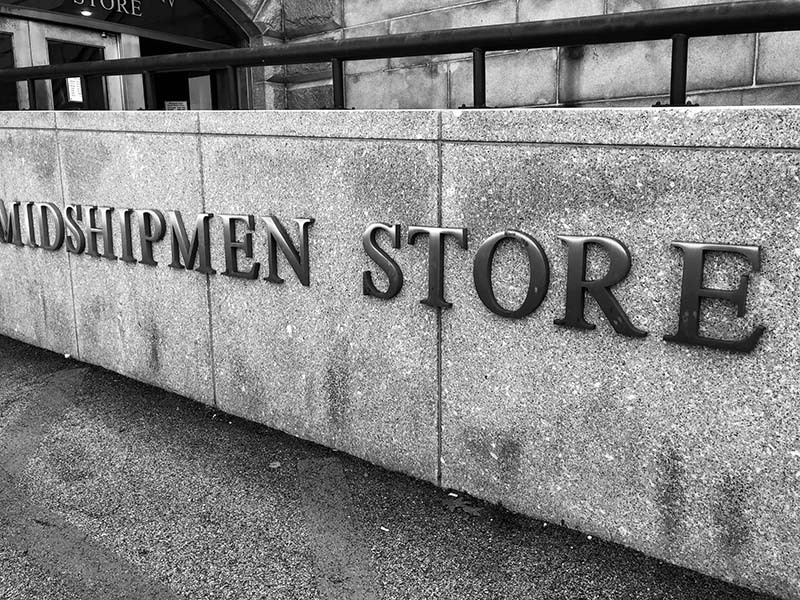 Personnel must present valid ID card to obtain an authorized Midshipmen Store shopping card. Contract employees working onboard USNA and the Annapolis Area Complex are not eligible patrons. USNA Alumni and their dependents. Alumni must present their gold alumni card. Unaccompanied spouses shall be issued a temporary shopping pass. All reunion groups presenting USNA Alumni Association reunion nametags (issued by the Alumni Association) will be eligible for patronage. Employees of the Naval Academy Alumni Association and Foundation, the Naval Academy Athletic Association (NAAA), the Naval Academy Business Services Division, the U.S. Naval Institute, and their dependents. Retired personnel with 20 years of service from these establishments remain eligible along with dependents. Employees to be issued a store shopping card. Spouses of deceased Alumni. Spouse to be issued a store shopping card. Naval Academy Club. 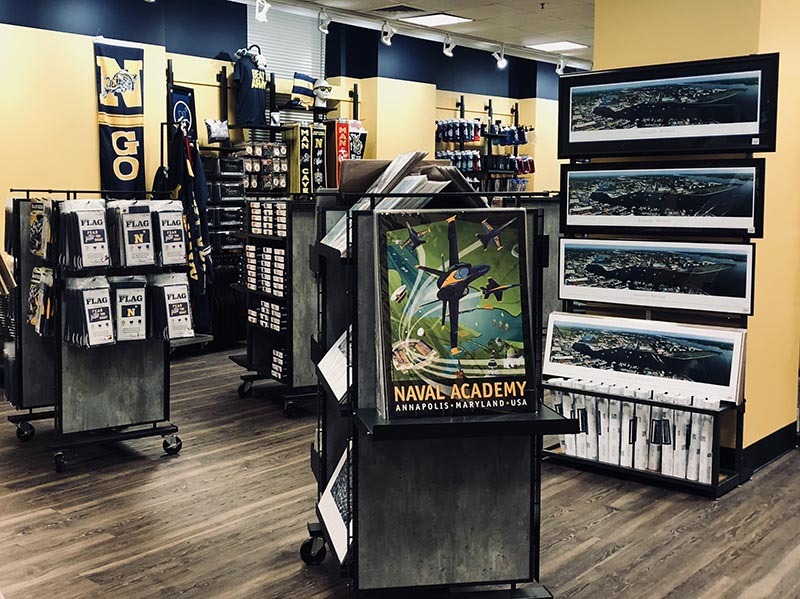 Patrons who have joined the Naval Academy Club are authorized patrons of the Midshipmen Store. Naval Academy Club members must present a valid Naval Academy Club card. USNA Blue and Gold Officers. 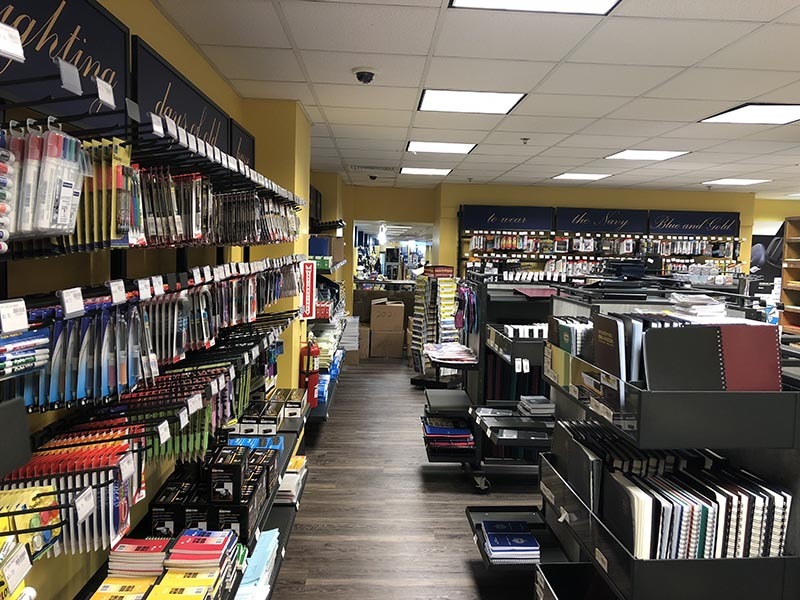 U. S. Naval Academy Blue and Gold officers will be issued a store shopping card by the Administrative Office if they do not already fulfill any of the categories above (four year expiration date). Their spouses may apply for a temporary shopping pass. Personnel approved as sponsors of midshipmen under the Naval Academy Sponsor Program during scheduled Sponsor Appreciation shopping periods. Retired Civilian Faculty and Staff. 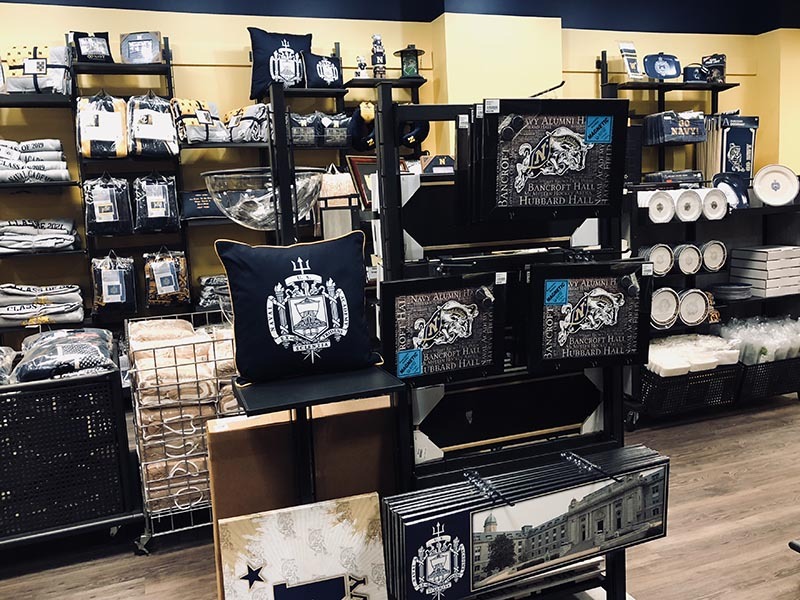 Retired faculty and staff must have at least 20 years of honorable service at USNA to meet patronage eligibility requirements and have obtained a DOD retired identification card in order to obtain a Midshipmen Store shopping card. 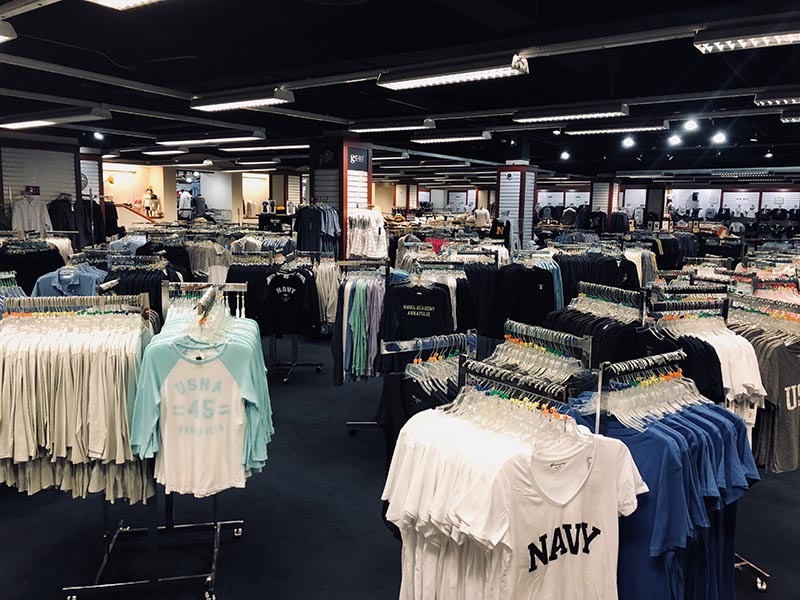 Faculty with Professor Emeritus status are to be issued a Midshipmen Store shopping card regardless of the years they have served. U.S. DoD civilians (not assigned to USNA or the Annapolis Area Complex). 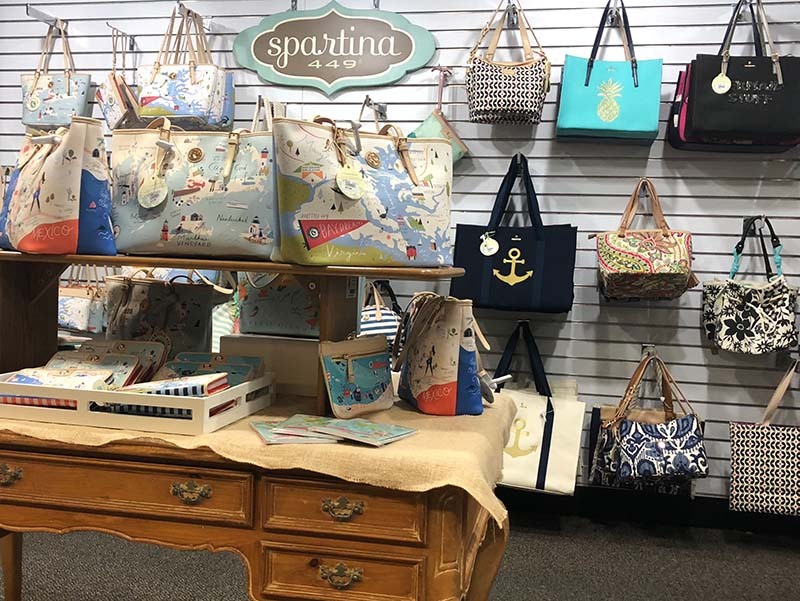 May shop on a limited basis (M-F when visiting USNA staff and faculty during the academic year and when the store is open during weekends and summer break). Personnel must present valid ID card (CAC). Honorably discharged veterans with 100% service connected disability and Medal of Honor recipients. Personnel must present valid ID card. Special Groups. Other special groups or individuals as determined by the Superintendent, Chief of Staff, Chief Financial Officer, Director, Naval Academy Business Services Division (NABSD), Deputy Director NABSD, the Midshipmen Store Manager, or his/her representative. Common sense should also prevail if a high-ranking official is visiting. They are authorized patrons. Note: If the Sales Associate knows the shopper is an authorized patron based on previous confirmation and asking for an ID card would appear redundant, the Sales Associate has the latitude to use their best judgment. Guests of authorized patrons are permitted to shop if accompanied by their sponsor, and the sponsor has valid ID. ALL exchanges and returns must be made within 45 days of purchase with register receipt. All merchandise must be in new, re-sellable condition. All tags and packing materials, including original boxes, must be returned. Merchandise in clam-shell type packaging must not be opened in order to be exchanged or returned. Returns after 45 days will be at the discretion of the department manager, assistant manager or store manager. After 45 days, merchandise will be exchanged for size ONLY if the same exact merchandise is currently stocked by the department. Clothing smelling of nicotine or containing pet hair or dandruff cannot be exchanged or returned. Pierced earrings, open food products and special order merchandise are not returnable. Any electronic equipment being returned may be subject to a restocking fee. Defective CD’s and DVD’s will only be replaced with the exact titles. 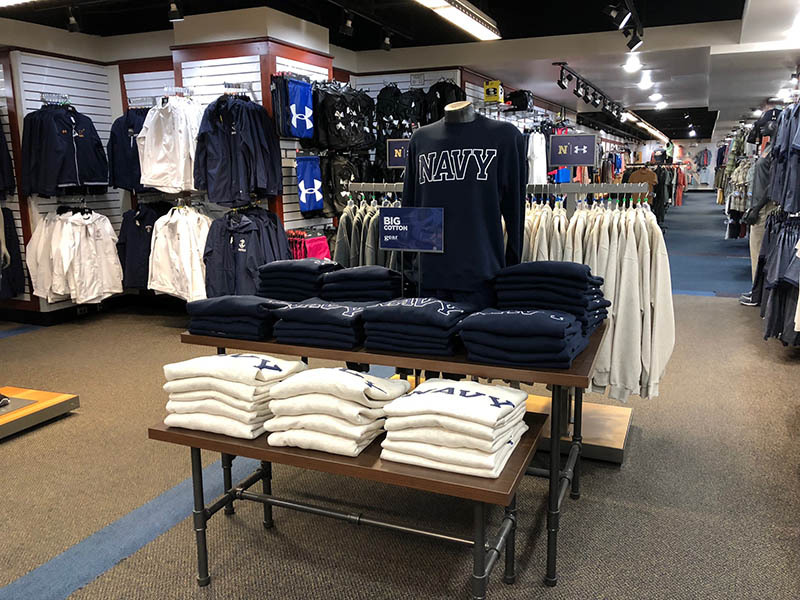 If a customer is not able to return to the store to do the exchange/return in person, the item(s) can be shipped to the Midshipmen Store to fall within the 45 day window. The customer is responsible for any shipping and handling charges. Please call the store for details.